This is a still of a film about boyhood. I shot it a few days ago. 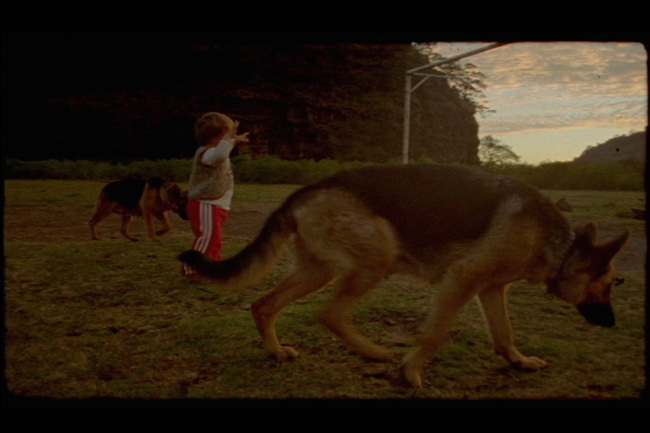 The boy walking is my son Eleazar and those are some of our dogs. The place is a beautiful football pitch. It is very near our house. We like to walk there at dusk when dragon flies are abundant in the rainy season. I appreciate the lack light at this hour, which will be lesser in the film, because sound becomes evidently present. Carlos Reygadas was born 1971, in Mexico City. He Became a Lawyer in Mexico and specialized in Armed Conflict Law in London. He worked for the European Commission and was a member of the Mexican Foreign Service. Between 1998 and 1999 Reygadas made four shorts in Belgium, learning film in a self taught manner after being rejected from film school in Brussels. In 2000 he shot his first feature film, JAPÓN (JAPAN). The film was presented at the Rotterdam Film Festival and received a special mention for the Caméra d’Or Award at the 2002 Cannes Film Festival, as well several other prizes. He presented BATALLA EN EL CIELO (BATTLE IN HEAVEN) in 2005, which was selected for Competition in Cannes and won the FIPRESCI Prize at Río de Janeiro International Film Festival among others. In 2007 his film STELLET LICHT (SILENT LIGHT) competed once more for the Palme d’Or at the Cannes Film Festival winning the Jury Award. He also won the Grand Prize at Riga International Film Forum ‘Arsenals’, the Golden Colón at Huelva Latin American Film Festival, the Grand Coral – First Prize and Best Director at Havana Film Festival, the Gold Hugo at Chicago International Film Festival, the Jury Award at Bergen International Film Festival, among others.